Haplogroup Q is found predominantly in Central Siberia, Central Asia and among Native Americans. 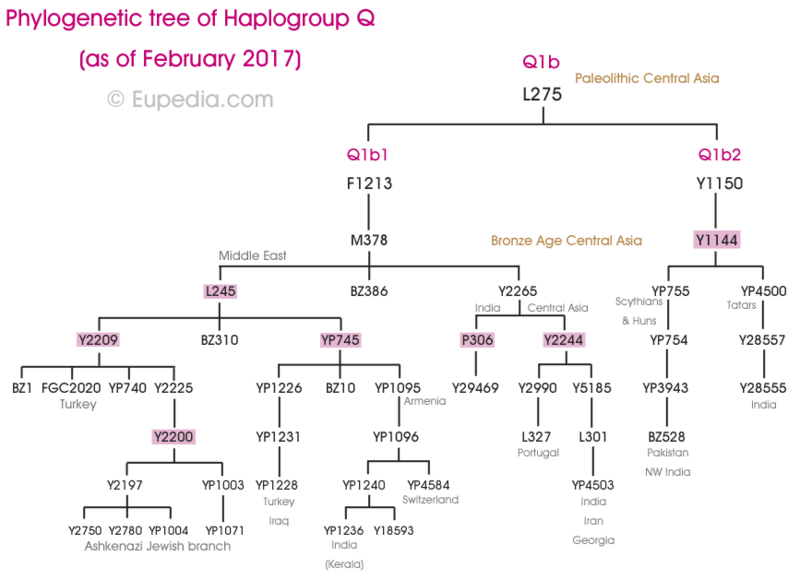 Approximately 90% of pre-Columbian Native Americans belonged to haplogroup Q, and all descend from the branch Q1a2a1 (L54), including various subclades of Q1a2a1a1 (M3) and Q1a2a1a2 (Z780). In Europe haplogroup Q is found chiefly in southern Sweden (5%), among Ashkenazi Jews (5%), and is various isolated pockets in central and Eastern Europe such as the Rhône-Alpes region of France, southern Sicily, southern Croatia, northern Serbia, parts of Poland and Ukraine. Šarić et al. (2013) also found 6.1% of haplogroup Q out of 412 samples from the island of Hvar in southern Croatia (accompanied by 2% of East Asian mtDNA haplogroup F). The oldest evidence to date of the presence of haplogroup Q is Europe are Q1a2-L56 samples from Mesolithic Latvia tested by Mathieson et al. (2017) and from the Khvalynsk culture (5200-4000 BCE), excavated in the middle Volga region and tested by Mathieson et al. (2016). The Khvalynsk culture is ancestral to the Yamna culture, which represents the Late Copper Age and Early Bronze Age homeland of the Proto-Indo-European speakers. 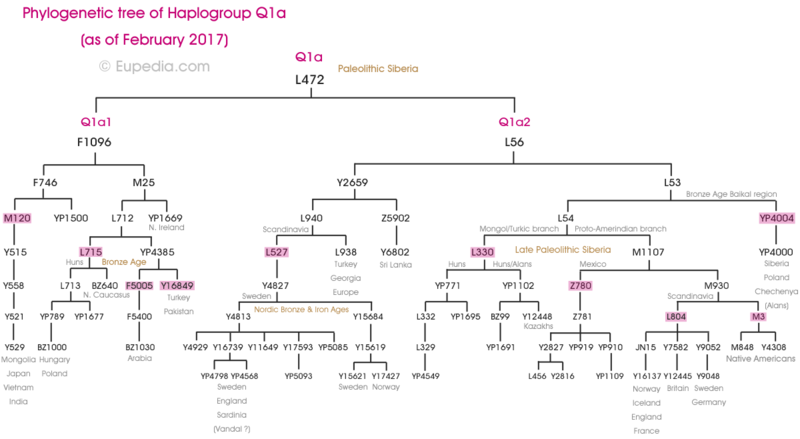 Q1a2 could have travelled alongside haplogroup R1a-Z284 (via Poland) or R1b-U106 (via the Danube) to Scandinavia, or have been present there since the Mesolithic, as in Latvia. Both scenarios are possible as modern Scandinavians belong to two distinct branches of L56: Y4827 and L804. In either cases, all modern carriers of each branch seem to descend from a single ancestor who lived only some 3,000 years ago, during what was then the Nordic Bronze Age. The maternal equivalents of that Siberian Q1a2 in prehistoric Eastern Europe are probably mtDNA haplogroups C4a and C5, which have been found Mesolithic Karelia (north-western Russia), in the Neolithic Dnieper-Donets culture in Ukraine, and in the Bronze Age Catacomb culture in the Pontic Steppe. Nowadays mtDNA C is mostly found among Siberians, Mongols and Native Americans, who happen to share Y-haplogroup Q1a2 on the paternal side. The analysis of prehistoric genomes from Eastern Europe did confirm the presence of a small percentage of Amerindian-related autosomal admixture. Oddly enough, the L804 branch, which descends from the same Northeast Siberian branch as the Native American M3, is now found exclusively in Germanic countries, including Scandinavia, Germany, Britain and northern France. Like the other Scandinavian branch (L527>Y4827), its genetic diversity suggests that this lineage expanded from a single ancestor living approximately 3,000 years ago, presumably in Scandinavia, in what would have been the Nordic Bronze Age. At present it remains unclear when and how Q1a2-L804 reached Europe in the first place, but it might have been a very long time ago, during the late glacial period or the Mesolithic period. It may well have arrived at the same time as Q-Y4827. Alternatively, L804 might have come as a minor lineage accompanying haplogroup N1c1 from Mongolia until it reached Northeast Europe during the Neolithic period, some 7,000 years ago. While Q1a is more Mongolian, Siberian and Native American, Q1b1 (F1213) appears to have originated in Central Asia and migrated early to South Asia and the Middle East. The highest frequency of Q1b1 in Europe is found among Ashkenazi Jews (5%) and Sephardic Jews (2%), suggesting that Q1b was present in the Levant before the Jewish disapora 2,000 years ago. In fact, Jewish Q1b all belong to the Y2200 subclade, which was formed some 2,600 years ago. Other subclades of Q1b1 are found throughout the Middle East, including, Armenia, Turkey, Iraq, Lebanon (2%), and in isolated places settled by the Phoenicians in southern Europe (Crete, Sicily, south-west Iberia). This means that Q1b must have been present in the Levant at latest around 1200 BCE, a very long time before the Hunnic migrations. One hypothesis is that Q1b reached the Middle East alongside haplogroup R1a-Z93 with the Indo-Iranian migrations from Central Asia during the Late Bronze Age. The age estimate for the Middle Eastern Q1b1a (L245) branch is 4,500 years, which corresponds roughly to the beginning of the Proto-Indo-Iranian expansion to Central Asia. The other branch, Q1b1b (Y2265) is found in Central Asia, Iran, Pakistan and India, a distribution that also agrees with an Indo-Iranian dispersal. Q1b1 was probably not one of the original lineages of Proto-Indo-European speakers of the Pontic-Caspian Steppe since it is almost completely absent from Balto-Slavic and Germanic countries. Nevertheless, it is reasonable to assume that Q1b1 was indigenous to the Ural mountains or Central Asia and was absorbed by the Indo-Iranian branch of the Indo-Europeans there during the Bronze Age, either during the Sintashta or Andronovo culture, then spread with the Indo-Aryans to India, Iran and the Near East. Q1b1 probably settled in the Levant at the same time as R1a-Z93, as both lineages are found among the Jews and the Lebanese and in places historically colonised by the Phoenicians. Autosomal analyses have confirmed that all Levantine people (Jews, Lebanese, Palestinians, Syrians) possess about 0.5% of Northeast Asian (Mongoloid) admixture. Since these populations lack Mongoloid mtDNA, the presence of Northeast Asian admixture can only be explained by the 2% of Q1b1 among Levantine men, the only paternal lineage of Mongoloid origin in the region. In contrast with Q1b1, Q1b2 (Y1150) is found almost exclusively in the Indian subcontinent. The two Q1b branch split from each others some 15,000 years ago, during the Late Paleolithic period. Data is still sparse about this subclade, but is it reasonable to assume that it has been in South Asia at least since the end of the last Ice Age, long before the Indo-European migrations. Elijah ben Solomon Zalman known as the Vilna Gaon (1720-1797) (subclade Q-Y2754) was one of the most influential rabbinic authorities since the Middle Ages, and—although he is properly an Acharon—he is held by many authorities after him as belonging to the Rishonim (rabbinic authorities of the Middle Ages). He belonged to a long line of rabbis traceable in the paternal lineage to Jacob Ashkenazi, who is estimated to have lived between 1480 and 1600. The Piątkowski Family (subclade Q-BZ66) is a Polish noble family of clan/herbu Pomian descdending from Jan Pi?tkowski herbu Pomian b. 1568. The Oppenheim Family is a German-Jewish banking family (Barons) which has been a prominent family in banking and finance in the European markets since at least the 18th century. According to Forbes magazine's Family Dynasties, the Oppenheim Family divides control of their multibillion-dollar fortune among 46 family members. Alfred Krupa (1915-1989) (subclade Q-YP1035) : was one of the 13 core artists of the Art of Croatian Antifascist Movement. He was the first man who invented the suitcase with wheels. Ernst von Fleischl-Marxow (1846-1891) (subclade Q-BZ38) was an Austrian physiologist and physician who became known for his important investigations on the electrical activity of nerves and the brain. He was also a creative inventor of new devices which were widely adopted in clinical medicine and physiological research. Jacob Bernstein (1888-1958) (subclade Q-YP1004) was an American chess master. He won three consecutive New York State Chess Championships (1920-1922), and shared 1st with Herman Steiner in 1929, but lost a tiebreak to him. Henry Judah Heimlich (1920-2016) (subclade Q-YP1036) was an American thoracic surgeon and medical researcher. He is widely credited as the inventor of the Heimlich maneuver, a technique of abdominal thrusts for stopping choking, described in Emergency Medicine in 1974. He also invented the Micro Trach portable oxygen system for ambulatory patients and the Heimlich Chest Drain Valve, or "flutter valve," which drains blood and air out of the chest cavity. Lee Van Cleef (1925-1989) is Hollywood actor known for his roles in Spaghetti Westerns such as The Good, the Bad and the Ugly. He is thought to have belonged to haplogroup Q1b1 (YP740 subclade) based on the testing of a relative. Nicholas F. Oppenheimer (b. 1945) is a South African businessman and philanthropist. He was formerly the Chairman of De Beers diamond mining company and of its subsidiary, the Diamond Trading Company, and former Deputy Chairman of the Anglo American Corporation. He is the 2nd richest African. Anson Williams (b. 1949) (subclade Q-YP1036) is an American actor and director, best known for his role as gullible but well intentioned singer Warren "Potsie" Weber on the television series Happy Days (1974–1984), a role for which he was nominated for the Golden Globe Award for Best Supporting Actor – Series, Miniseries or Television Film.